Solid state physics offers a rich variety of intriguing phenomena, several of which are not yet fully understood. Experiments with fermionic atoms in optical lattices get very close to imitating the behaviour of electrons in solid state crystals, thus forming a well-controlled quantum simulator for these systems. In (a) an originally obtained picture of a one-dimensional atomic chain is shown. The thick horizontal lines illustrate the barrier between different chains. In each chain, an atom appearing on the upper side of the thin dashed horizontal line has upward pointing magnetic moment (red) and vice versa as shown in the reconstructed image (b). In some cases, doubly occupied sites or holes (empty sites) are detected. Now a team of scientists around Professor Immanuel Bloch and Dr. Christian Groß at the Max Planck Institute of Quantum Optics have observed the emergence of antiferromagnetic order over a correlation length of several lattice sites in a chain of fermionic atoms. Contrary to the ferromagnetism we experience in everyday life, these antiferromagnets are characterized by an alternating alignment of the elementary magnetic moment associated with each electron or atom. 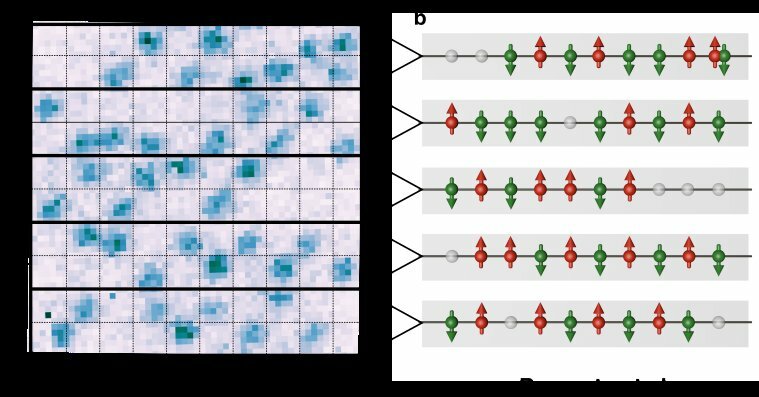 Combining their quantum gas microscope with advanced local manipulation techniques, the scientists were able to simultaneously observe the spin and the density distribution with single-site resolution and single atom sensitivity. By approaching the conditions prevailing in macroscopic crystals with fermionic quantum many-body systems, one hopes to achieve a better understanding of phenomena such as the so-called high-temperature superconductivity. The experiment started with cooling a cloud of fermionic lithium-6 atoms down to extremely low temperatures, a millionth of a Kelvin above absolute zero. These ultracold fermions were then trapped by light fields and forced into a single plane, which in turn was further split in several one-dimensional tubes. Finally, an optical lattice was applied along the tubes mimicking the periodic potential that electrons see in a real material. Web Source: Max Planck Institute of Quantum Optics.